Later, s’mores will be devoured and scary stories told. But first, there’s dinner to figure out. 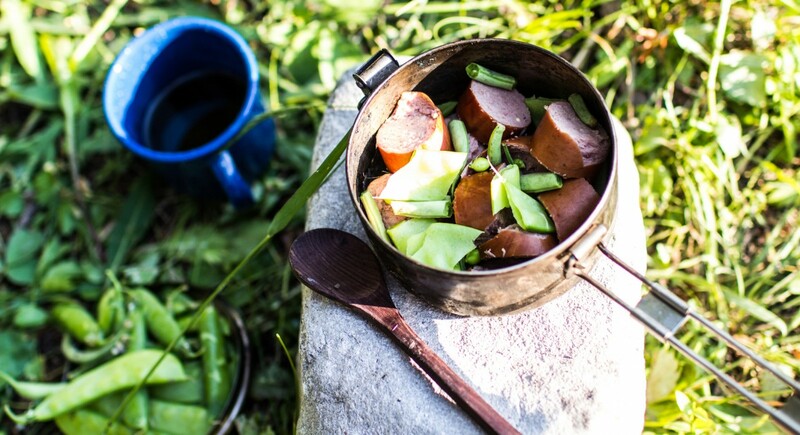 Whether you’re roughing it in a tent or sleeping in an air-conditioned RV, cooking while camping can be a challenge. For one thing, you’re probably working with only a few pots and pans and a single cooler’s worth of food. And, who wants to spend hours preparing meals when there’s wilderness to explore and stargazing to do? And you don’t even need to rely on heavily processed stuff (like sugary trail mix, Cheetos, canned baked beans) to sustain you. These five tips and tricks will help you whip up tasty, healthy meals in a flash—even if you only have some tinfoil and a campfire. It’s not as simple as just throwing everything in with ice the morning of. If you want everything to stay fresh for the whole trip, here’s what you need to know. Do: Chill the cooler first. Fill it to the top with ice and let it sit for 30 minutes to get nice and cold. Then pack the food. Don’t: Use a cooler that’s too big. A full cooler is a cold cooler, and two small ones might do the job better than one enormous one. Do: Pack strategically. Put the ingredients you’ll use on the last day on the bottom, then work your way up to minimize the amount of rummaging you’ll have to do. Remember, the longer the lid stays open, the more cold air escapes. Don’t: Ignore food safety. Here’s a rough guide to how long each type of food will last, but also use your best judgment—if something seems off, don’t eat it. Be your own prep cook and get all the grunt work done before you leave, which will save you time later and conserve space. Here are some of our favorite make-ahead tricks. Crack only as many eggs as you need into an empty water bottle, and store in the cooler. At breakfast time, just shake the bottle and go for scrambled eggs without a whisk. This might be the most camping-friendly breakfast of all time. Pulverize some oats, add spices, nuts, and dried fruit, and store in a bag or mason jar. In the morning, when you’re making coffee, just heat a little extra water, add to the mix, and it’s done. When packing frozen meats or proteins, add marinade and seal them in ziplock bags. As they thaw, they’ll absorb the flavor and be ready to cook. Chop a medley of vegetables and store them in another sealable bag. Sides for the next few days—done! Reason: it’s ideal for roasting food directly on the white-hot coals—no dishes to wash, and no fancy equipment required. For dinner, wrap meat, vegetables, and aromatics in two layers of tin foil, leaving a little extra room for steam. Arrange sliced vegetables on the bottom of the packet to protect the meat from drying out or burning, and top it all with a generous amount of oil. (Some campers suggest wrapping meat in cabbage leaves for the same purpose). As with marinades, these foil packet meals can be assembled ahead of time, too. Campfire cones: Fill sugar cones with chocolate chips, mini marshmallows, and berries. Then wrap the whole thing in foil and place among the coals to melt. Challenge yourself to bring as few pots, pans, and utensils as possible on your next excursion. As these next tricks show, you don’t really need them. Scout’s honor—making bacon and eggs in a paper bag really works. Thick slices of bacon make a nest for the eggs, and a generous coating of grease keeps the bag from catching. Be careful, though—holding it close enough to the flames to cook takes some patience. Bring along a few oranges, too, as they do double duty as snacks and makeshift muffin tins. Instead of peeling them with your hands, slice them in half and scoop out the flesh. (It’s just as tasty, but requires a spoon to eat). Then, fill the peel with muffin batter or pre-made cinnamon rolls, wrap in trusty tin foil, and bake it in the fire. Breakfast is served! If you’re going to bring one thing, choose the cast-iron skillet. It’s easy to clean (bring a bar of unscented, biodegradable soap and call it a day) and the perfect vessel for one-pot meals. Plus, you can set it right on top of the fire grate or use it on a two-burner camp stove. Get started with these dinner ideas, and you’ll be a fan in no time. Toss pre-chopped veggies, potatoes, and eggs in the skillet for a quick breakfast (or dinner!) hash. Turn nachos into dinner by topping them with fresh vegetables and your protein of choice. Whip up a quick stir-fry, like this simple recipe for spicy chicken and kale. So throw another log on the fire, cuddle up with some hot cocoa, and bring on the ghost stories and stargazing—dinner’s a wrap.